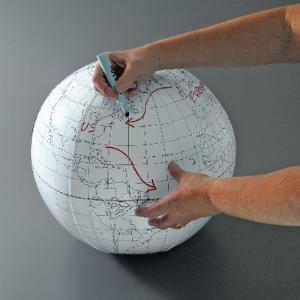 Students can use this globe for a hands-on lesson in world geography. By using wet-erase markers, students can toss the ball around the room and record information as they go. Or, you can mark certain geographical features such as oceans, countries, or continents and quiz your students as they throw the ball. It comes with a list of creative ways to use it. Size: 24" dia.